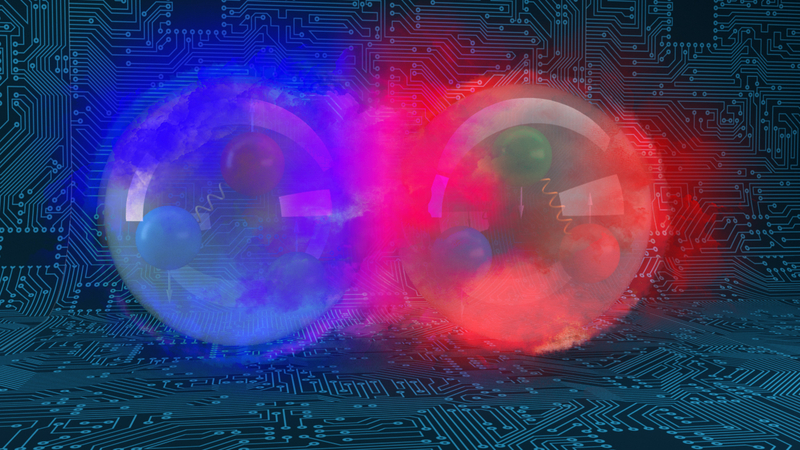 Graphical representation of a deuteron, the bound state of a proton (red) and a neutron (blue). Credit: Andy Sproles/Oak Ridge National Laboratory, U.S. Dept. of Energy. OAK RIDGE, Tenn., May 23, 2018—Scientists at the Department of Energy’s Oak Ridge National Laboratory are the first to successfully simulate an atomic nucleus using a quantum computer. The results, published in Physical Review Letters, demonstrate the ability of quantum systems to compute nuclear physics problems and serve as a benchmark for future calculations. In October 2017 the multidivisional ORNL team started developing codes to perform simulations on the IBM QX5 and the Rigetti 19Q quantum computers through DOE’s Quantum Testbed Pathfinder project, an effort to verify and validate scientific applications on different quantum hardware types. Using freely available pyQuil software, a library designed for producing programs in the quantum instruction language, the researchers wrote a code that was sent first to a simulator and then to the cloud-based IBM QX5 and Rigetti 19Q systems. The team performed more than 700,000 quantum computing measurements of the energy of a deuteron, the nuclear bound state of a proton and a neutron. From these measurements, the team extracted the deuteron’s binding energy—the minimum amount of energy needed to disassemble it into these subatomic particles. The deuteron is the simplest composite atomic nucleus, making it an ideal candidate for the project. At the completion of the project, the team’s results on two and three qubits were within 2 and 3 percent, respectively, of the correct answer on a classical computer, and the quantum computation became the first of its kind in the nuclear physics community. The proof-of-principle simulation paves the way for computing much heavier nuclei with many more protons and neutrons on quantum systems in the future. Quantum computers have potential applications in cryptography, artificial intelligence, and weather forecasting because each additional qubit becomes entangled—or tied inextricably—to the others, exponentially increasing the number of possible outcomes for the measured state at the end. This very benefit, however, also has adverse effects on the system because errors may also scale exponentially with problem size. Papenbrock said the team’s hope is that improved hardware will eventually enable scientists to solve problems that cannot be solved on traditional high-performance computing resources—not even on the ones at the OLCF. In the future, quantum computations of complex nuclei could unravel important details about the properties of matter, the formation of heavy elements, and the origins of the universe. Results from the study, titled “Cloud Quantum Computing of an Atomic Nucleus,” were published in Physical Review Letters. The paper’s coauthors, all from ORNL, were Eugene F. Dumitrescu, Alex J. McCaskey, Gaute Hagen, Gustav R. Jansen, Titus D. Morris, Thomas Papenbrock, Raphael C. Pooser, David J. Dean, and Pavel Lougovski. Hagen, Morris, Papenbrock, and Pooser also are affiliated with the University of Tennessee, Knoxville. The team’s research was supported by DOE’s Office of Science. ORNL is managed by UT-Battelle for DOE’s Office of Science. The Office of Science is the single largest supporter of basic research in the physical sciences in the United States and is working to address some of the most pressing challenges of our time. For more information, please visit https://science.energy.gov/.